The faces of Tyler, Almas, and Bridget light up at the mention of what their campaign could symbolize to younger students. None of them expected this question to be asked but as we sit outside at Tuttleman, I knew this question mattered because representation matters. Tyler Lum, Bridget Warlea, and Almas Ayaz are running in this year's TSG election. 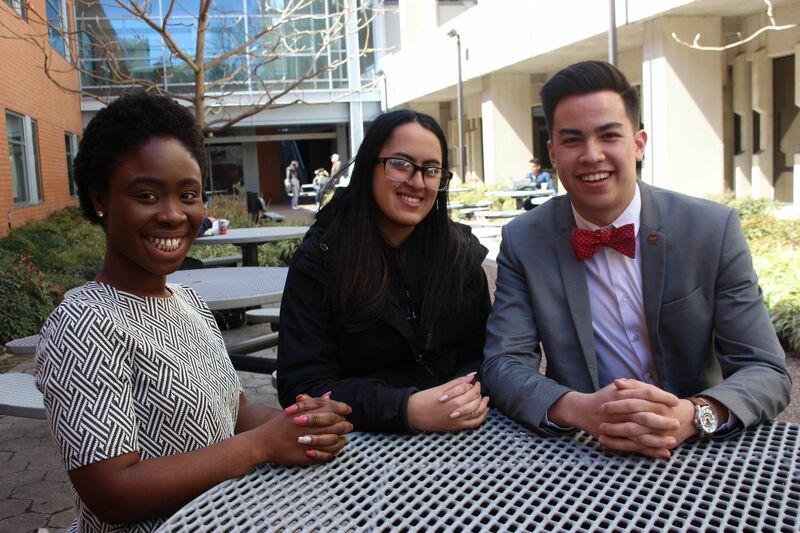 For these three Temple students, their campaign Voice TU, hopes to unite the culture within the Temple and North Philadelphia community by providing tools for students to better understand both communities. Their platform wishes to do many things such as expand resources for survivors of sexual violence, directly address hate-speech, implement active shooter drills, advocate for better transportation options, expand & advance LGBTQIA+ resources, and more. I sat down with Voice TU to find out more about their team and what this election truly means to them. How did you first get involved with Temple Student Government? Tyler: I first met Jai Singletary my freshmen year and he was at the time the Vice President of External Affairs. I met him outside of the office and he said "Hey, come to the office and talk to me". So I went to the office and that was my first time at the TSG office. So he just started talking about what he was doing and I said it looked really cool. He then said my biggest tip if you want to do well at this university is to get involved with the community. I thought it was an interesting take because I was already really involved within Temple. I was on track to become an Owl Team leader and Owl ambassador, but I knew I needed to get more involved in the community. When Activate TU won last year, I applied during their application process when they were trying to fill spots. I ended up being selected to be a director. Almas: So for me, I came to Temple already wanting to become part of TSG. I used to love doing student government in high school. I remember the current administration at that time didn't seem accessible and I couldn't see myself in TSG. I went a different route and got involved with other student organizations where I saw people like myself. Tyrell (our current TSG president) was one of the RA's in my building during my freshmen year. So when he was running and I kind of finessed my way onto his campaign team! I really saw myself through Kayla (Vice President of Services), Paige (Vice President of External Affairs), and Tyrell. It really encouraged me to use my voice and realize how much say I can have on this campus. When they did win, I applied to be a director and then it felt right for the next step to be this. Bridget: My freshmen year, I was part of the elections commission. Our elections commissioner was great and that was a nice introduction to TSG. I did that during the spring of my freshmen year and then in the fall, someone told me about Parliament being created through Empower and suggested that I should run. So I ran in the fall of 2016 as the Multicultural representative and the first cohort of Parliament. I won that and then ran again in the end of Spring 2017, so I've been in Parliament since the beginning. I really liked being a representative and then becoming Speaker of Parliament. Why do you decide to run this year? Tyler: I feel like my experiences up till this point have prepared me perfectly to step into this next role. I decided to take this next step and what's great about being a sophomore and stepping into this role is after our term is over⏤I can look back and see the change that I have made. That's one of the things I'm really excited about. Almas: For me, it's a stepping stone for growth. The three of us have talked about what we want to do on campus and what change it should be. We all agreed that when we grew up wherever you go or do, leave it better than what you found it. That's our goal. Bridget: I've been very involved with the North Philadelphia community and also, Temple University since my freshmen year. My experiences, knowledge, and skills have allowed me to grow into this position I'm running for. Just thinking about the ideas I'm already brainstorming and having conversations with principals across the areas or meeting with pastors, I don't want to sound arrogant but I believe I am the only person who can properly execute this plan. We're really at a tipping point with everything with the stadium and student voices being heard, we need somebody strong in TSG but also someone who knows their stuff. Can you tell me what's the main points of your platform that you hope to achieve if elected? Tyler: I would say a voting seat on the Board of Trustees. Some teams might think it's insignificant but I think one vote can really matter. The United States was established with the idea that we shouldn't have taxation without representation and at this point, our tuition is our tax here. We are not having a vote and a vote is really going to matter as far as pushing what we are trying to get done but for every administration to follow us also. If they don't have a vote, they're going to get stuck in the same situation that past TSG administrations have gotten stuck with. Almas: I think finding ways to use our spaces smarter and more effectively. Being part of other student organizations, you realize the lack of space and we must keep in mind that we don't want to grow out because there's community here as well. I know there's organizations having issues finding space to meet and fighting for rooms with other organizations. We need to find new ways resolve this and also inclusion for every student, in order for them to have a voice. Bridget: I think improving community relations but also giving them a stake of what we do. I think that being a student government member is great and my role would entail to represent them but we should let the community speak for themselves. I believe it's my job to pass the mic and let them into these spaces to vocalize anything they wish to discuss. We should also empower Temple students to be opened to continue this relationship with North Philadelphia community. It can be volunteering, working in the area⏤there's so much potential that we have as students that can help us and the community. We're here for four years and in that four years, we can do so much. I want us to use all of our voices, all of our skills to really help the area. I would also advocate for a community advisory council so we can have a structure and every administration after that can have this coalition of community members and stakeholders that we can go to have these conversations. Many students do not want to vote or are unaware of the TSG elections. What would you say to those students who believe we, as students, have no real say? Tyler: When you see the amount of impact students can have when they rally together, the March for Our Lives for example, students do have the power. It's often confused on campus, who has the power. Students or the university? Some people might argue it's the alumni, some people might say it's the administration, and others will argue it's the donors or the Board of Trustees. At the end of the day, none of those people matter if there were no students in this university and the best way to advocate what the students need is through student government. We already have that established seat in the table, although it's not a voting seat, which we will get! It's important to vote and make sure the people you put in this office know what they are talking about. Oftentimes, during debates or campaign season, everyone thinks they know about everything or the university which isn't all true. You need someone who knows a lot about the university but is willing to learn more. How important is it for your team to address hate speech on campus? Almas: I think it's very important and the reason why we put it in our platform is because we care so much about it. Through my various roles as a TSG director and RA, I see how much it affects people. It's important that it's addressed and we support the students who are affected by it. Oftentimes, hate speech and hateful rhetoric are confused with a difference of opinion. We encourage those with a difference of opinion to be open to dialogue but we don't want that to be mistaken with hate speech because we do not support hate speech. Bridget: In high school, I was a diversity facilitator and my school was predominately White. It takes a level of vulnerability to say you're ignorant and I would encourage those students who believe they're not racist or that's not who they want to be, to educate themselves. We want to help support the victims but also educate those people who are in the middle because that's where we will see the difference. As for your crisis resource center, how do you plan to execute this? Tyler: We need to be frank that every class that comes into Temple is the largest of the year prior. Unfortunately, since we've been here, the resources have not grown at all. If they have grown, it's very little because students spoke out about it. We need a place for students who are distressed and can't wait two weeks to go to a counseling session. They need help now. Whether it's before they go to class or their job later. We need to be open and honest about the fact that we do not know where we will put this center. It's a conversation we have to have with the university but it's also a conversation the university has to have with us. What's your final words to students on campus about your campaign? Tyler: At the end of the day, all three of us have been doing a lot of our own work since we've arrived on campus. It's not necessarily that we need the office to complete what we are trying to do but the office would help us with our mission to complete a lot of our goals for the university. I know if I do not win this election, I'll keep doing the work I want to do and I am still going to be part of that community conversations. I never let a role define me and this won't change a scenario. My voice is not the only voice that matters, it's everyone as well. Almas: To echo what Tyler said, our voices are not going to stop here if we don't win. This is just an opportunity for us to bring more voices to the table. Bridget: Look at what we have done so far and that shows we will continue to do what we are doing, no matter what. I think when you're making that decision to who to vote for, it's not just who's your friend but it's who has an established record for the things that they want to get done. Do you guys ever think about younger students looking up to you? What would you tell them right now? Almas: Use your voice. From day one and even with Jai helping Tyler, there's always that one person or upperclassman. If we're grateful enough to have students looking up to us then that's great. I definitely encourage everyone to find your space or that one person. Whether it's in an organization or anywhere else, try everything. I tried a lot of organizations until I found that one that fit for me and let myself grow in there. I joined the South Asian Student Society my freshmen year and now I'm their president. I can see the growth of the organization and also in myself through that and it's empowering to see yourself grow. Tyler: It's so weird to think about a freshmen looking at me in that way. I used to always say from my senior year of high school to my freshmen year, my goal was to always be the person who I would have look up to as a kid. I feel like that's the most genuine person within you because we were all looking for role models growing up and I have role models who are even my age or slightly order. It's really cool but I never ever thought of the possibility of that ever happening. Bridget: Take calculated risks. I came into Temple with this whole plan and now I'm in my junior year with a lot of big things happening. I've made mistakes, failed but I have also succeeded. I would say start failing and succeeding freshmen year. That's when you really learn what you're made of and passionate about. In addition to making calculated risks, find your passion and space. I really love engaging with North Philadelphia community and that's where I started. I began to work with Stepping Stone Scholars, a non-profit organization based now here at Temple University. I've been involved with the schools in the neighborhoods in Philadelphia since my freshmen year and that added to my perspective as a Temple student. Think who you want to be and how I can get there while having some fun along the way. Some of my role models don't even look like me. Tyler: If you're a freshmen out there, reach out! At the end of the day, you'll realize that people you idolize are human too. They make a lot of mistakes, they question themselves, they've been through a lot to get where they are at. Reach out and have conversations. Voting begins on April 4th and April 5th. For more information on Voice TU, visit their website.